The method of counting changed with this issue from the actual Independence Day to the Anniversary of Independence. Hence the 1925 7th Independence Day was followed by this, the 1926 7th Anniversary of Independence. The initial printing was in sheets of 4, approx. 105 x 115mm. A later printing was in sheets of 8 (comprising 2 panes of 4), approx. 175 x 115mm. Sheets of either printing are scarce. Sheets smaller than 105mm wide are likely to be panes fom the larger sheets, which are found more frequently. Sheet from the initial printing. The stamps can also be found imperf. The stamps comes in two sheades, deep blue (as the sheet above) and dark violet blue (as the examples below). 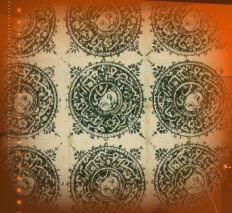 An example used on cover from Kabul, via Landikhana, to Peshawar (3rd March 1926). An example used from Kabul, dated 1325 Hoot 9 (= 28th February 1926), the day given by Scott for the first day of issue, but a day later than that given by Gibbons.